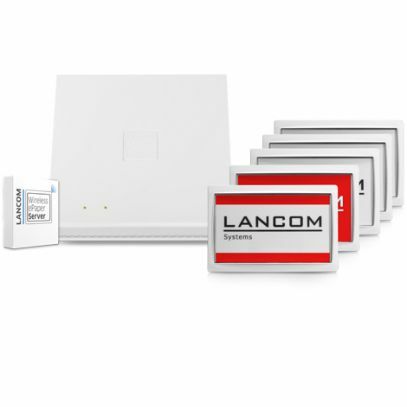 The LANCOM Wireless ePaper Room Signage Set is an all-in-one package for setting up a modern, radio-controlled signage for modern premises: The powerful LANCOM LN-830E Wireless, five LANCOM Wireless ePaper Displays size 7.4” as perfect elegant room labels, as well as the LANCOM Wireless ePaper Server for the management and monitoring of an unlimited number of access points and up to 1.000 displays. The powerful server allows a connection to calendar management systems via API – for an easy data transfer to your displays without complications. With the new three-color display option in red, black and white you can create visual highlights and increase the perception of the provided information. The LANCOM Wireless ePaper Display 7.4“ Premium Frame, as an ideal optional supplement to the Room Signage Set, creates a modern and solid atmosphere.